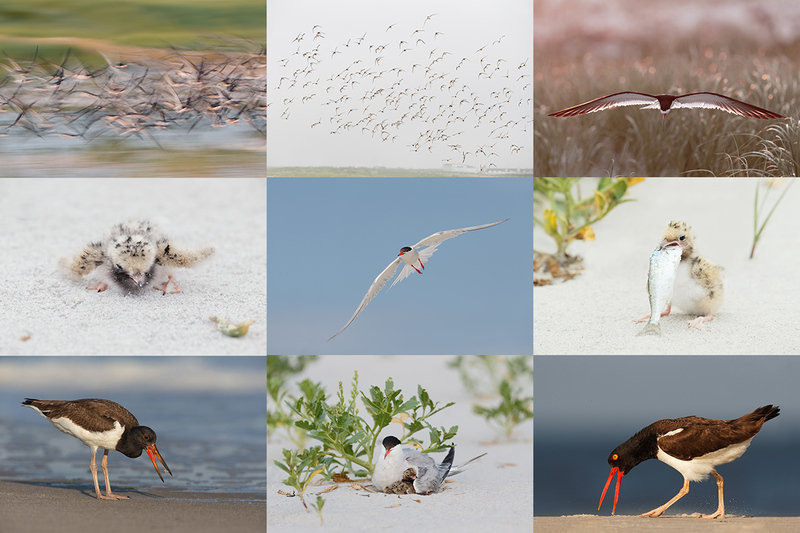 Nickerson Baby Beach-nesting Birds IPT: 3-Full Days/July 15-17, 2014: $1199. Introductory meet and greet: 8pm, Monday, July 14, 2014. Co-leaders Arthur Morris and Denise Ippolito. Limit 12/Openings 3. There is lots of room on the Nickerson Beach IPT and time is running out. Please scroll down here for details. It is now just after 8:20am here on a sunny day at Indian Lake Estates. This post took about 3 1/2 hours to prepare after several updates. Enjoy and learn. This post marks 203 consecutive days with a new blog post. With so many folks getting in the habit of using our B&H links and our Amazon logo-links why quit now? April, May and June have been fantastic as lots of folks are getting the message; using my affiliate links does not cost you a penny and helps support my efforts here. To show your appreciation, I do ask that you use our the B&H and Amazon affiliate links on the right side of the blog for all of your purchases. Please check the availability of all photographic accessories in the BIRDS AS ART Online Store, especially Gitzo tripods, Wimberley tripod heads, and the like. We sell only what I have used and tested, and know that you can depend on. We will not sell you junk. We know the tools that you need to make creating great images easy and fun. And we are always glad to answer your gear questions via e-mail. 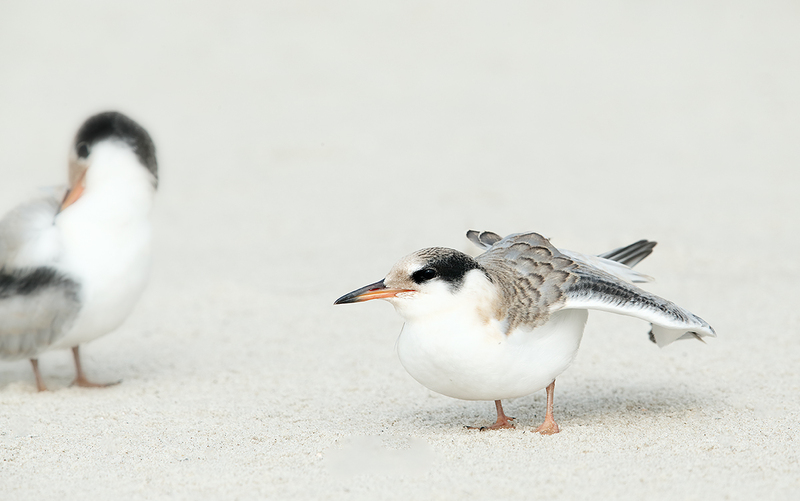 This Common Tern fledgling with friend image was created on July 22 on last July’s Nickerson Beach IPT while I was seated behind my lowered Gitzo 3532 LS carbon fiber tripod with a Mongoose M3.6 head on it, the Canon EF 600mm f/4L IS II USM lens, the Canon 2x EF Extender III (Teleconverter), and the Canon EOS-1D X. ISO 400. Evaluative metering +2 stops: 1/640 sec. at f/10 in Manual Mode. Central sensor (by necessity)/AI Servo Expand/Rear Focus on the subject’s eye and re-compose. Click here if you missed the Rear Focus Tutorial. Click on the image to see a larger version. This is the original capture. After each morning of photography at Nickerson Beach, IPT or not, we head to Bagel Plaza in Merrick for some great coffee (decaf for me) and an early lunch. Part of being a diabetic with gliaden allergy tendencies is no bagels. But I have a good memory (for food at least!) The bagels are great. As good as the bagels from Howard Beach and as good as the bagels from the Bay Gull store in Broad Channel. But bagel plaza has lots of great stuff for me to eat and the boys and girls on IPTs always enjoy our visits. They have a large seating area with a few electrical outlets scattered about and the management does not mind if we hang out to get some work done. One of the favorite learning experiences on all IPTs is to have folks see how I edit the images from a single session in BreezeBrowser. More important than my blue check-marks for keepers technique is that I explain my reasoning. “Which is better? A or B? Why?” We are able to discuss dozens of factors that influence the decision to keep one image and delete another: head angle, light angle, quality of light and other lighting considerations; sharpness, subject to film plane orientation; distracting elements; subject size; and dozens or other very fine points. I have long planned to do an editing eGuide. Though I have saved many dozens of series of images for this potential publication I am not sure if I will get to it any time soon…. I am too busy having fun. 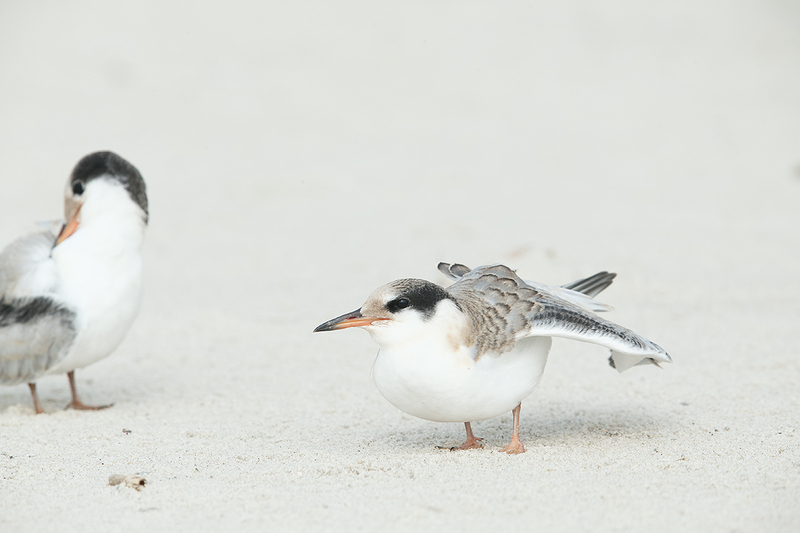 IAC, let’s take a look at the image above of two fledgling Common Terns. I wish that I had been well to the left to better parallel the subject but moving quickly while seated in never an option. And wing stretches are always cool. This was my first version of the image above. My first thought was to get the image down to a single bird.You should only go with a relatively large crop as above when you are starting with a sharp, high quality image file. After converting the image in DPP I did some beach and bill clean-up and covered the second bird with a large Quick Mask. Then a small color correction. Next I ran Auto Contrast on a layer at 40% opacity to give the image some pop; that thanks to a tip from Denise Ippolito. Next I selected the face and crown with the Quick Selection Tool, applied a Contrast Mask for selective, non-destructive sharpening and lightened the selection by pulling up the curve (Control M). Lastly I darkened the pupil a bit using Digital Eye Doctor techniques. This was my second version. Taking a second look at the original image that opened this blog post, I liked that I had followed the compositional principles for creating front-end verticals: be sure to include both legs with a small border behind them. 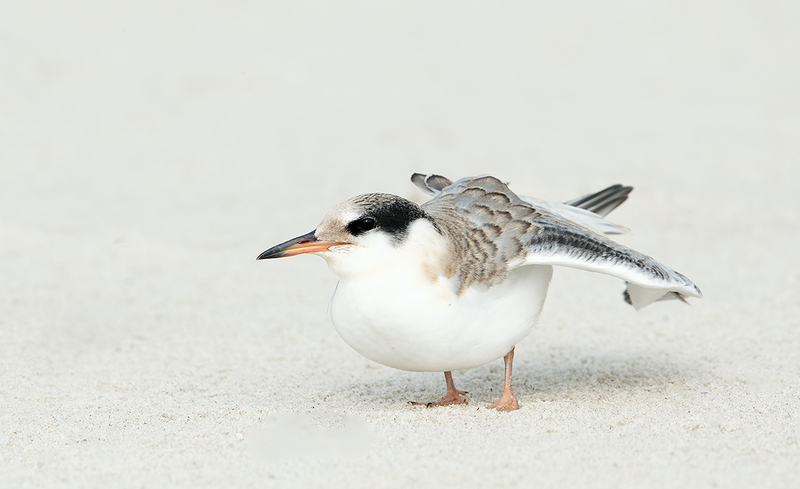 So I created a second version that included both young terns, possible siblings. To make the second bird a bit less of a distraction, I selected it with a large Quick Mask, applied a fairly large Gaussian blur, and then reduced the effect to taste by reducing the opacity while viewing the whole image. Please take a moment to leave a comment and let us know which version you like best, the 1st version (with just the 1 bird) or the 2nd version, with 2 birds). If you have no idea what I am talking about when I speak of a front-end vertical composition, check out the section on Advanced Composition and Image Design in The Art of Bird Photography II. ABP II, 916 pages with 900+ images on CD only, is the all-new continuation of The Art of Bird Photography, the classic how-to book on bird photography. Folks who are new here or new to bird photography are advised to purchase both and save $10 here. I can only wish that the comprehensive information contained in these two books was available when I started more than three decades ago…. Canon recently released a new version of DPP, V4.0. It can be downloaded here. You will need to enter your 1D X or 5D Mark III serial number to start the download. I downloaded 4.0 to my old computer and opened it yesterday. While early reports are that it is significantly better in many areas than any previous versions, I was totally baffled by the interface. It bears no resemblance to any current version of DPP. If I can figure it out, and I am sure that I will at some point, there will be an all-new DPP V4.0 eGuide that will require a separate purchase. V4.0 works only with 1D X, 5D III, 6D, and 1Dc (whatever that is) images. Folks with older bodies (both pro-sumer and professional) will need to continue using previous versions of DPP. I recently updated to V3.11 and have been very happy with it and was glad to note the addition of a Color Temperature slider. Everything that I did to optimize today’s image is detailed in the Digital Basics File–written in my easy-to-follow, easy-to-understand style. Are you tired of making your images look worse in Photoshop? Digital Basics File is an instructional PDF that is sent via e-mail. It includes my complete digital workflow, dozens of great Photoshop tips, the use of Contrast Masks, several different ways of expanding and filling in canvas, all of my time-saving Keyboard Shortcuts, Quick Masking, Layer Masking, and NIK Color Efex Pro basics, my killer image clean-up techniques, Digital Eye Doctor, creating time-saving actions, and lots more. Learn the details of advanced Quick Masking techniques in APTATS I. Learn Advanced Layer Masking Techniques in APTATS I. Mention this blog post and apply a $5 discount to either with phone orders only. Buy both APTATS I and APTATS II and we will be glad to apply at $15 discount with phone orders only. Please call Jim or Jennifer weekdays at 863-221-2372 to take advantage of this special offer. With a small group pretty much guaranteed, do consider joining us on Long Island, NY this coming July to photograph Black Skimmers–it’s looking like a great year for skimmer nesting, Common Terns with chicks, American Oystercatcher families, and possibly some just-hatched Black Skimmer chicks. The opportunities will include chances to photograph a variety of breeding behaviors including courtship feeding, display flight and combat, and copulations. Car-pooling is recommended; if we opt to return to the beach before 5pm on cloudy days for example) there is a $30/vehicle parking fee that is not included so it is best to share that expense. Parking in the morning is free. Because of the late date, your non-refundable payment in full is due when you register. 5 comments to Like Bagels? Hi, Artie. I like the idea of two birds. I took some photos of an adult swan with its chick the other day, and they were both preening themselves at one point, which was cute; it seemed the little one was copying the adult. Even though only the adult was in sharp focus, I decided to keep them. So again, I like the idea in principle. But in this case, the blurry bird is as big as the sharp one and so I find the image a bit distracting. So I prefer the one with the single bird. Yep, that’s me! Getting back into it after weathering the financial storm…I’ll be seeing you again on one of your SUPERB IPT trips within a year, I should think. :). Great to see you here and glad to hear that things are picking up. I think that you’ve been to Bosque with me; maybe the San Diego IPT in late January/early February 2105 will work for you. Dates to be announced soon. It will be great to see you again. You are correct, DPP 4.0 works only with the cameras you listed, but you left out the 6D on your list. Reportedly, Canon have said other current cameras will be added…in 2015! Thanks Bill. Have you figured out V4.0 yet? Is this my old friend IPT veteran William T. Lloyd? In construction if I remember….